Uganda: Pipeline Dreams - Will Locals Cash in On the Oil Bonanza? A fuel tanker offloads petroleum products at City Oil. Before mid-2017, Hotel Brovad in Masaka District was just like any other business in the hospitality industry; still, it is. Then in May that year, the presidents of Uganda and Tanzania signed the Heads of State Agreement concretising the Hoima-Tanga route for the proposed East African Crude Oil Export Pipeline (EACOP). A week later, the Energy ministers of both countries inked the Intergovernmental Agreement (IGA) that binds the governments on the $3.55b (Shs13 trillion) infrastructure. Not long after in 2018, the hotel started getting overwhelmed with reservations by people who had something to do with the pipeline. Then pre-qualification adverts started running in newspapers calling for hotels which can provide decent accommodation, etcetera; the rest is now history, Ms Sarah Kiyimba, the hotel proprietor, says. "What helped me were the standards; not that I'm boasting in anyway but my hotel is so far the best in Masaka," she told Daily Monitor. From the signing of the IGA, back-to-back activities like geo-technical, geophysical, front end engineering designs, environment and social impact assessments, land mapping and surveying of the route, and resettlement action plan studies, which required teams of foreign and local staff to comb the pipeline route from Hoima to Mutukula at the border with Tanzania, followed subsequently. The pipeline runs through 179 villages in 10 districts--Hoima, Kikuube, Kakumiro, Kyankwanzi, Mubende, Gomba, Ssembabule, Lwengo, Kyotera and Rakai. With the guest list filling up, Ms Kiyimba said it had a "trickle down" effect, requiring a steady supply of "quality" food stuff but sometimes they have travel for distances. "We have our network of farmers, butchers, dairies and others in the supply chain but at times their supply fell short," she said. "Going out to look for others meant we had to subject them to the same [high] standards, and as you know that is where the problem is." Hotel and catering is one of the 16 fields, out the 25 detailed in the 2014 industrial baseline survey, which are ring-fenced for Ugandans in the oil and gas sector. Others are transport and logistics, security, civil works, human resource management, survey, camp management and provision of labour. The baseline survey titled; 'A survey to foster opportunities for Ugandans in the Oil and Gas sector' postulated that the next phases--development and production--of the sector will create between 100,000 and 150,000 direct and indirect jobs over the coming years. 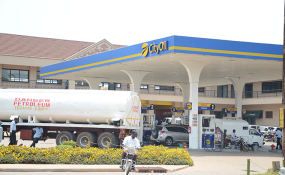 This is, however, subject to the expected investments of at least $15b (Shs36 trillion), including $6b (Shs21 trillion) for development of the Tilenga oil fields in Nwoya and Buliisa districts operated by Total E&P, and Kingfisher operated by Cnooc, and attendant infrastructures like two central processing facilities for filtering crude oil and power generation, and a network of feeder pipelines. Other big projects anticipated are the pipeline (EACOP) to cost $3.55b (Shs13 trillion) and an oil refinery to cost $3b (Shs11 trillion). Construction of Kabaale International Airport is already ongoing, with the first usable runway expected to be complete by end of this year. Since the commercial oil volumes were announced in 2006, participation of Ugandans in the nascent sector has been a sticking issue. Until 2016, the country saw investments to a tune of $3.2b (Shs11 trillion) but local service providers raked in only 28 per cent of that or roughly $900 million (Shs3b) mostly going to logistics, clearing and forwarding, supply chain management, catering services, air transport services (light aircraft carriers to the field) and camp management services. However, between 2014, when global prices of crude oil plunged, and 2017 as government and oil companies--Total E&P, Cnooc, and Tullow, embarked on the discussions for the next development phase, activities dropped significantly, almost edging some local contractors out of business. The recent shuffling over the oil pipeline negotiations has enlivened the industry with high hopes and expectations yet again. Mr Ernest Rubondo, the executive director of the Petroleum Authority of Uganda, the oil sector regulator, said several local companies have already been involved in the preparatory activities for the oil pipeline "which is good trendsetter." "For the activities that we anticipate, those we are doing preparation.Our role as a regulator is to ensure that there is steady flow of information about the opportunities; we want Ugandan enterprises to know that something is coming, and they should prepare. Whether they do that is mostly up to them," Mr Rubondo said. When Gulf Interstate Engineering completed the technical FEED studies, which detailed characteristics of the pipeline and what material will be required to put it together, Mr Rubondo said they compelled the company to organise sessions for local companies about available opportunities. "By now, we really assume that Ugandans should be aware that opportunities that are coming," he said. Late last year, PAU revealed that it approved $428m (Shs1.5 trillion) as the total budget for oil companies' activities in 2018, an in increase by $200m (Shs735b) approved in 2017, but with the much anticipated final investment decision (FID) in June this year--notwithstanding the incoming politicking, which usually dissuades investors--for development of the oil fields and pipeline, costs and budgets are expected to increase to $1b (Shs1.5t). As a regulator of local content in the oil sector, PAU has also put in place initiatives such as the National Supplier Database--an online roster for all service providers--and the National Talent Register, an online one-stop centre for all jobs in the industry--to boost and cushion local service providers/contractors, but still that has not allayed fears and anxieties of locals losing out. In broad terms, local content is defined as "the value addition by Ugandans using Ugandan materials, with services produced by Ugandans and Ugandan firms" with the aim of keeping money from the sector within the country while at the same time promoting local industries. Mr Tony Okao Otoa, the head of Stanbic Bank's business incubator programme aimed at uplifting SMEs, speaking at the national content conference on February 9, said several local suppliers have "some really good business concepts" but are mainly set back by failure to adhere to standards, lack of business plans and financial records, and poor banking and borrowing history, which makes it hard for them to compete favourably with either established local companies or foreign firms. The issue of poor standards is probably one the most pressing issues facing local service providers. Those that happen to meet standards, maintain neat records, or have succinct business plans, often face an uphill task of the huge capital requirements, and yet the banks also, out of fear of piling more non-performing loans portfolios, have learnt to tread carefully. There has been a proposal of either maximum capitalisation of Uganda Development Bank or establishment of a local content fund--tokened by both government and service providers. Mr Emmanuel Mugarura, the executive officer of the Association of Uganda Oil and Gas Providers (AUGOS), said there are many opportunities that a Ugandan company can enjoy, but the challenges are many too. These include high cost of doing business, competition from more experienced players, lack of specialised and certified personnel. "The local service providers are better prepared than they were six years ago. Most companies have invested in training and certification. We have more skilled people than ever before. Others have built partnerships and are ready to take on the task. The delay was a blessing in disguise," he said. Mr Mugarura also said conversations with oil companies and other players in the sector are continuous on aspects such as capacity building, information sharing and ability to build a strong local workforce thatshould run the industry. "What is encouraging is that they seem to agree with us on the path we want to take," he said. In the oil pipeline's case, Mr Mugarura said the dilemma is while it is transporting Uganda's oil, the larger part of is in Tanzania--another jurisdiction hence different culture and rules. He said the Tanzanian government is a little more sympathetic to their own citizens, their companies and people enjoy more protection from their government. "But you have to look at this holistically. Oil is an international commodity and the geopolitics transcend an individual country's interests. So, as we go into the actual work, you may find there is uniformity in execution and work. So, I am not worried about that. All we need is a more and better understanding of the industry so that we can reap more with less risks and casualties." During the inter-government ministerial meeting held on January 25 in Kampala as part of ongoing oil pipeline negotiations, the Tanzanian Energy minister, Mr Medard Kalemani, said they have so far mobilised some 250 contractors to engage in the Engineering, Procurement, and Construction (EPC) phase which will likely start in Tanzania as Uganda runs through politics. Asked about rallying local contractors for the same, Mr Rubondo said "for us we are interested in the process; I would be very hesitant to start counting that we have 500 or even 1,000 companies because they are several processes that lead to that." Notwithstanding, Mr Rubondo hinted on ongoing discussions with the Energy and Water Utilities Regulatory Authority, which is charged with monitoring performance and standards, about possibility of cross-border movement of local contractors and construction material--than going scouting in foreign markets. Sources familiar with ongoing inter-government negotiations told Daily Monitor that local content is an emotive issue on the Tanzanian side. Speaking in Dar-es-Salaam, the Tanzanian lead negotiator on the pipeline, Mr Goodluck Shirima, said while capacity on building pipelines is limited, comparatively Tanzania has been doing related work for some time--have built the Tanzania-Zambia Mafuta (Tazama) pipeline. "We have experience, but we have to boost capacity. We are humble people; we believe in dialoguing and not so in quarreling as a solution," he said. Mr Shirima also said the Tanzanian private sector "is in agreement with government initiatives" to reap big from the project. "In Tanzania, we have local content regulations but in outlook, we don't want to inhibit opportunities for citizens," he said. Mr Maxim Marchenko, the EACOP project director, told Daily Monitor that local participation and local content is at the centre of their plans, and discussions with the different parties are ongoing. He said for the EPC phase, an estimated 50,000 tonnes of construction material will be required. Ms Aminah Bukenya, the Cnooc's senior public relations manager, said "the plan is to maximise as much as possible the use of local manpower, local goods and service providers; this indeed is in line with the national content regulations." "To promote its national content performance, Cnooc developed its own national content strategy, with an aim to identify the opportunities for National Content, help the national suppliers to be able to take the opportunities, and support the national companies to play a more active role in the oil and gas industry," she added. The aspect of training and equipping potential employees with the right skill set is another cause for worry. In several towns on the pipeline route, communities have been told to prepare to supply labour during the construction phase, but do they match the required skills? Efforts: The World Bank and Germany's GIZ through the assessment and skilling project reinforced some training courses in, among others, welding at technical institutes in Hoima and Lwengo, but is a drop in the ocean given the extent of work project. Ms Susan Murekatete, one the recent graduates in 2G pipeline welding at Lwengo Technical Institute, told Daily Monitor that her first prospect is work in the oil industry but "openings in the sector are a seesaw." As regards closing the skills gap, Mr James Bagaya, the Academic registrar of Uganda Petroleum Institute Kigumba (UPIK), said they have mandate to train as many as 250 students--technicians and craftsmen--per year but have limited facilities. Limitations: "We are running diploma and certificate courses and we would like all these courses to be internationally certified to make our graduates more placed in the oil and gas sector. However, the challenge is the cost associated with international certification, for instance, we have so far trained more than 140 who underwent a generic curriculum accredited by Uganda," Mr Bagaya said. Yet, the baseline survey highlighted the need to strengthen education in terms of compliance to oil and gas certification requirements and on-the-job practical training.